The Line 6 Relay G10S wireless guitar and bass system offers professional features, rugged build quality, and plug-and-play operation in a compact platform. The Relay G10S system integrates seamlessly into any pedalboard or can function as a standalone unit. It features an impressive range of up to 130 feet line-of-sight, enabling you to move about untethered on any stage. The Line 6 Relay wireless family has been embraced by professionals for the range's reliability, ease of use and transparent sound, and the Relay G10S receiver is no exception. 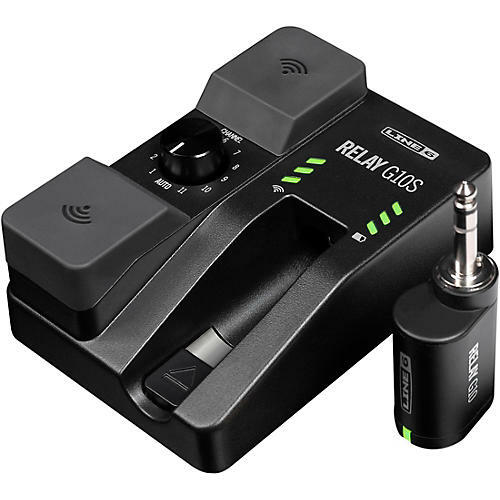 Plus, it's compatible with the Relay G10, G30, G50, G55 and G90 guitar wireless systems. Getting started with the Relay G10S is simply a matter of turning it on—no complicated setup required. Once powered up, the unit immediately locates and locks onto the strongest available wireless frequency, and you’re ready to rock. You can also adjust the frequency selection manually, which is helpful to avoid interference with other band members using wireless units. The Relay G10S features a rugged metal housing designed to withstand the rigors of gigging. And RF and battery status indicators are conveniently located on the face of the pedal, making it easy to monitor system status at a glance. As the Relay G10S is designed to fit on your pedalboard along with your favorite effects, it features a convenient 9V DC power input. You can either use the included power adapter cable or connect it to a plug from your pedalboard's power supply. On the instrument side, the G10T transmitter runs on a rechargeable battery that lasts for eight hours. What's more, the battery automatically enters sleep mode when you're not playing, significantly extending how much playing time you can get from a single charge. When you’re ready to recharge, just plug the G10T into the Relay G10S receiver, and it automatically begins recharging. Relay G10S is equipped with two different outputs, making it extremely versatile. In addition to a standard 1/4" jack for connecting it to your pedalboard or amp, there’s also a balanced XLR output that allows the G10S to be used as a wireless DI box for applications such as connecting acoustic guitars or basses directly to a PA.